Chennai, Sept 28 - Business establishments and offices remain closed in Chennai on Sunday after Tamil Nadu Chief Minister J Jayalalithaa was sentenced to serve four years in jail and asked to pay a fine of Rs. 100 crores in connection with a disproportionate assets case by a Bangalore Special Court on Saturday. The AIADMK party cadres protested in front of the party headquarter in Chennai raising slogans in favour of their party supremo. "All we need is our Amma, she has done many good things to people and she has favoured us with many schemes like amma Canteen, laptop etc, she is for people and poor. We need only our Amma or else we will set ablaze. 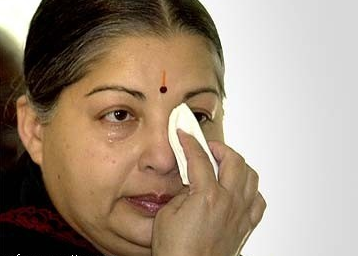 On MLA'S meeting: We will accept whom our Amma shows," an AIADMK cadre Sheela said here. Anuradha Jose Thomas, AIADMK counsellor, Pollachi district said, "As the MLAs meeting is expected to happen today to discuss about the next CM. The cadres say they will accept whomever Amma shows." AIADMK supporters had on Saturday picketed and protested outside the court premises, at the Tamil Nadu-Karnataka border and outside the residence of DMK leader M. Karunanidhi.